Despite being just two years in existence, Heffernan Truck Repairs of Milford, Co Carlow has developed a reputation for reliability and quality workmanship which is the envy of many of its competitors. The Commercial Vehicle Roadworthiness Test (CVRT) is a roadworthiness test for all commercial vehicles, buses with more than eight passenger seats and ambulances, all over one year old. The purpose of the test is to ensure that these vehicles are in good condition throughout their entire life. All commercial vehicles must be tested when they are over one year old and annually after that. The ultimate goal is to keep Irish roads safe and Commercial Vehicle Roadworthiness Testing (CVRT) is part of that effort. Better vehicle standards mean fewer collisions and safer roads. Keeping your vehicle up to date is also better for your business, plus it's the law. A one-man operation offering a one-stop shop for all your truck and trailer needs, Heffernan Truck Repairs can help ensure that you stay on the right side of the law. 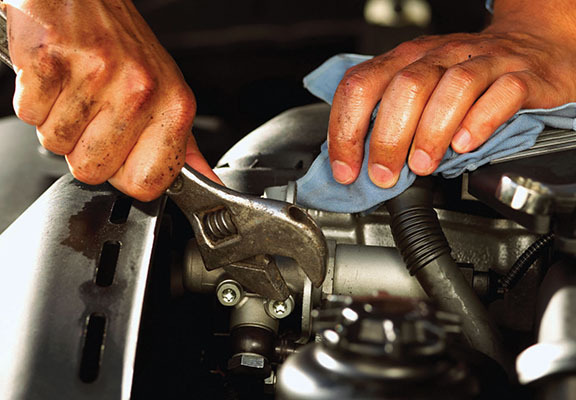 Heffernan Truck Repairs is a leading commercial vehicle preparation and servicing facility conveniently located in Carlow. It's workshop is fully equipped for commercial vehicle and trailer servicing, inspections, diagnostic analysis and repairs. Proprietor Tony Heffernan brings 20 years experience as a mechanic to the table and he has extensive knowledge of all truck and trailer types. Dedicated to customer satisfaction, back in 2013, the Milford native took the brave decision to go out on his own and it has very much been a case of so far, so good. And he has not intentions of resting on his laurels because he has plans to recruit a couple of employees as long as business continues on an upward trend. In the last two years he has successfully built an excellent reputation within the local motor industry for providing a service tailor made to meet the needs of his clients. Consequently much of his business comes from word of mouth and satisfied repeat customers. Boasting a state-of-the-art workshop, Tony has invested in the latest diagnostic equipment to assist in all truck management systems. He prides himself on his competitive rates and excellent customer service. At Heffernan Truck Repairs, all repairs and servicing are done to the highest standard and Tony is very competitive with his rates. His aim to look after all our customers needs and requirements to ensure satisfaction. In addition, all parts used within are from well established and reputable suppliers. “Luckily, things have gone well for me since setting up the business and I'm optimistic about what the future holds because there will always be a need for truck and trailer repairs one way or the other. If you give Tony a call at the number below you can look forward to a friendly and efficient service.